Look for our NEW 2019 special Alstroemeria and Iris Collection offers when you click on View Catalogue at the top of the page. Whilst you are there, please look out for our 2019 new plant introductions. 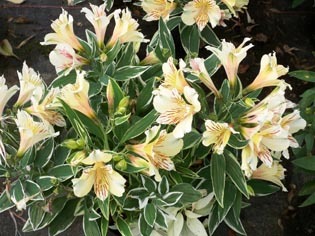 Alstroemeria are despatched as well established, nursery grown, large 1.5 litre plants (not bare root). Tall bearded Iris are despatched as large divisions, ready to plant straight outside. 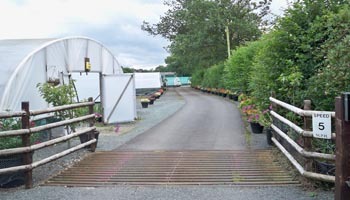 Welcome to our family run nursery website, based here in Shropshire. 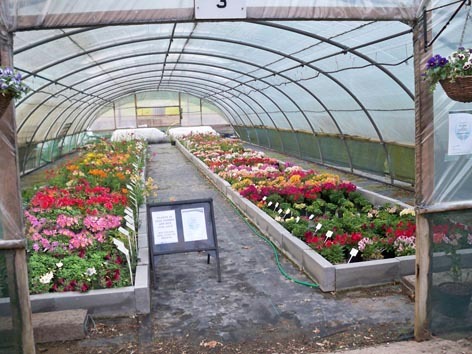 We have been operating as a nursery for over 30 years growing Alstroemeria and herbaceous plants. 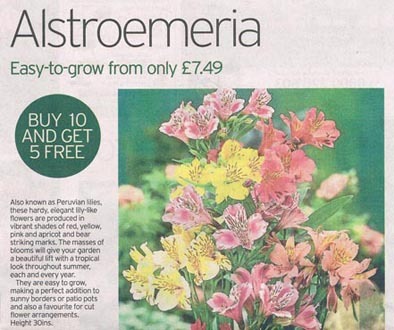 For the last 20 years we have specialised in growing Alstroemeria, selling direct to the public. We are also able to offer 42 different varieties of stunning tall bearded Iris. And this year we have put together two Alstroemeria collections and five Iris collections, representing a saving on buying the plants individually. If you would like any advice or if you would prefer to give me an order over the telephone please do give me a ring on 01939 291475. 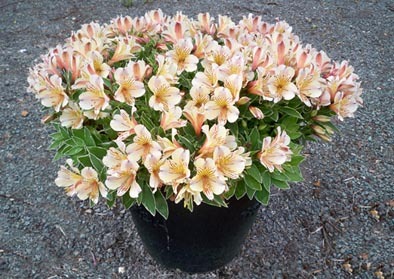 To view our full range of Alstroemeria, please click on this link Alstroemeria or use the View Catalogue link above for our range of plants. If you need some help with your selection just give us a ring on the number at the top of the page. Before you order your plants, please scroll down to the NHS banner on this Home Page for details of the correct spacing and spread of this species. We are delighted to offer 42 different Iris varieties this year. To view our full range of Iris, please click on this link tall bearded Iris or use the View Catalogue link above for our range of plants. If you need some help with your selection just give us a ring on the number at the top of the page. Below is a picture of the Iris in full flower growing in one of our tunnels. 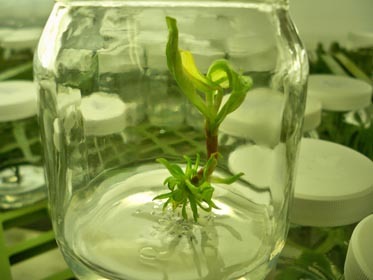 All of our Alstroemeria are produced from tissue culture in a micropropagation laboratory. 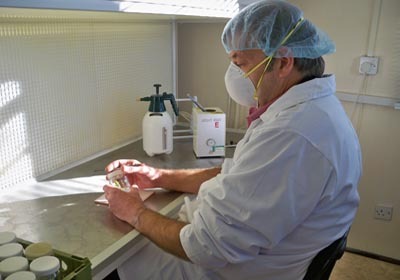 We are currently setting up a laboratory here at the nursery but until this is established we rely on the supply from other laboratories. Some varieties are not always available as they run a strictly seasonal production cycle. If you are interested in plants that are marked as not currently being in stock, please telephone or e-mail us and we may be able to give you an idea of when we expect them to be back in production. 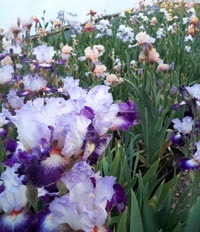 Irises will be sold as large, home grown divisions from February to early winter, depending on the weather conditions. There is a minimum order of £30 plant value for Alstroemeria, Iris or combined orders. This does not include the Iris Collections, which are posted separately via Royal Mail small package. Orders will be acknowledged personally by e-mail within a few days, giving an estimated delivery date. In normal circumstances, Alstroemeria plants will usually be despatched within 2 to 3 weeks from receipt of your order according to plant availability, but in extremes of hot (or cold) temperatures, plants will be held here in the nursery until the weather improves. Irises will be despatched from early February through to early winter, depending on the weather. P&P is charged at £9.95 for all orders up to £99.99 and reduced to £4.95 for orders of £100 or over for mainland UK. Please note that orders to the Highlands of Scotland, Northern Ireland, Isles of Scilly and Isle of Man will incur and additional carriage charge. We can send plants to most European countries at competitive carriage rates, please ask for a quote before ordering. If you would like a copy of our illustrated catalogue please give us a ring on 01939 291 475 or request one using the Contact us link at the top of the page. Our on-line catalogue will be regularly updated with all the current availability details. If you wish to reserve plants that are not yet available please give me a ring or drop me an e-mail. We take your card security very seriously. When you order on our website you will be taken directly to the Worldpay secure website to make your payment. You will see the address change to https (which means it is secure) and the Worldpay padlock to ensure that your details are safe. Our website complies with the most up to date industry regulations (Payment Card Industry Data Security Standard). The logo below verifies that we comply with the strict procedures for processing card payments. In order to keep track of your order and create a shopping basket, our website uses small text files called ‘cookies’. These harmless files are removed from your computer as soon as you leave our site. We do not use ‘persistent’ or ‘tracking’ cookies that can remember you when you return to the site. Using our website implies that you understand and agree to this. 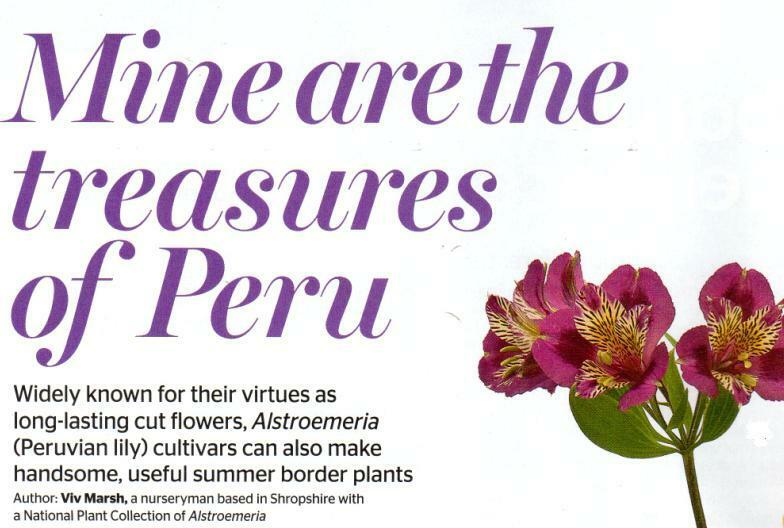 If you are a member of the RHS, look out for the article on Alstroemeria that I wrote for The Garden magazine. You might have heard on BBC Radio Shropshire from time to time or seen on Countryfile about the charity. 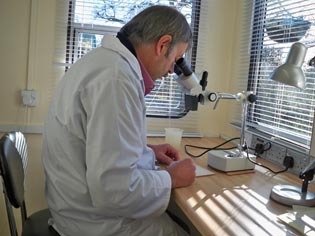 We have been breeding osmia solitary bees in the wild for over ten years. My remit is to initiate the concept of breeding these bees back in the hands of the general public. As a qualified farmer as well as horticulturalist, I feel well placed to carry out this task. In my spare time, I work as a volunteer for Shrewsbury and Telford Hospitals. 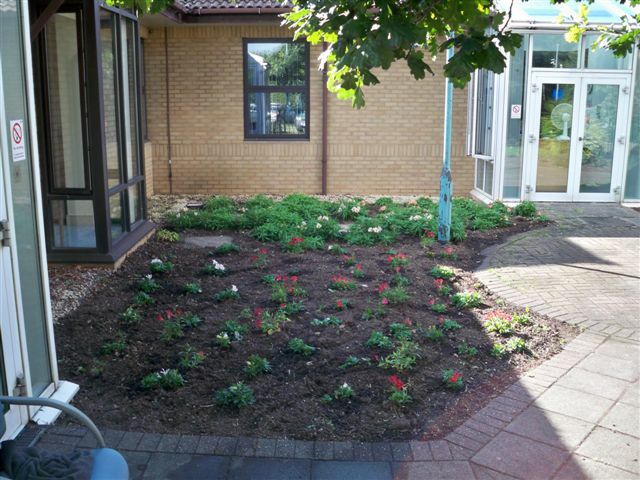 You can see from the images above the new Alstroemeria garden I am building outside Ward 16, and you can now see from the picture below, how the planting went. The reason I have shown you these pictures is to give you an idea just how much compost you need to dig into your own flower bed to make it suitable for Alstroemeria and also show you the correct spacing of these plants, which is roughly 18 inches apart. 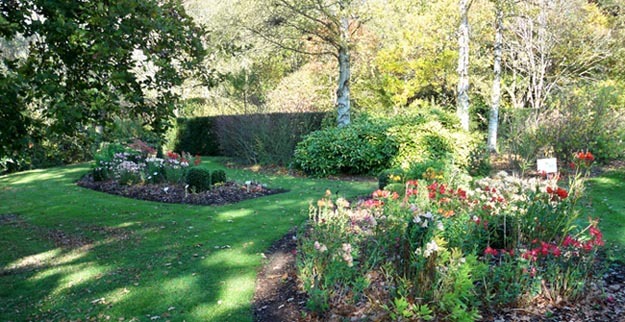 The purpose of this display bed is to create a solid carpet of Alstroemeria. 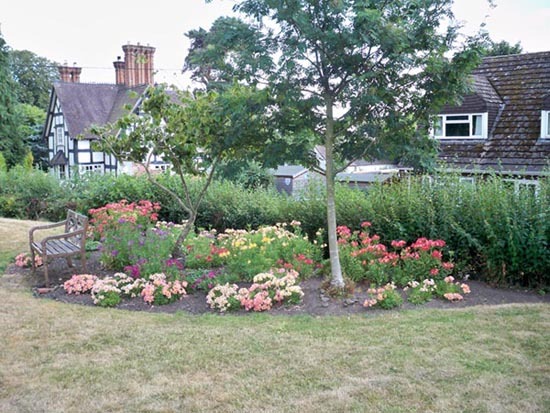 If, however, you are planting bespoke Alstroemeria into your herbaceous border, you need to cater for an eventual spread of 2 ft for these plants. 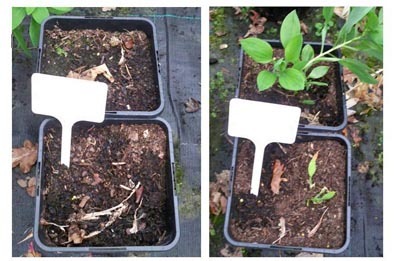 Should this spread be too great for your planting plan, then simply use the garden spade to keep the plant spread to the size you want. Take a look at the picture above with the tree bark I put on this display bed. This is what I want you to do when you hopefully buy some of my plants. After the first frosts have burnt off the old foliage, tip out eight inches of good quality tree bark. This can be removed temporarily the following April or left as a much against weeds. 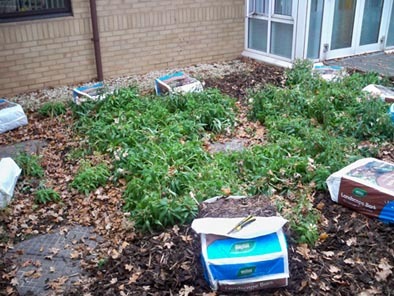 After the first two winter seasons of planting, the Alstroemeria will have pulled themselves deeper into the soil, below the frost zone and this temporary duvet of tree bark will no longer be needed. If you are stuck for gift ideas, why not let the gardener in your family or friends choose their own present? You can order a gift voucher for any amount of your choice by telephone, on the number above. We will include a card and catalogue which will be sent to the delivery address of your choice (or to your address to give personally). ALSTROEMERIA BARE ROOT PLANTS OR POTS? The old adage 'You don’t get something for nothing' has never been so true! We only sell large, 1.5 litre plants, which is the equivalent of a standard plant you would find in a garden centre. Our plants are well established which means they will flower this season. When comparing our prices, please bear this in mind. We do not send out plugs or small, 7cm or 9cm pots as we feel these are too small to plant directly into the ground. We would never send alstroemeria plants bare root, as we feel there is a strong possibility that they will not survive. To buy bare root Alstroemeria is very risky, with high mortality rates from bacterial and fungal root rots. To plant bare root in the autumn is simply utter folly. Please don’t be tempted when you see adverts like the one below for bare root plants. To illustrate my point, I sent for some different varieties as bare roots in the spring and grew them alongside my micropropagated varieties. You can see for yourself the results in the picture below. Just compare this with a micropropagated plant that was potted up at the same time growing in the same tunnel! Put two of these plants in a large pot and you will end up with a display like the one below in a year’s time, which will give you flowers from late spring until the first frosts. After many years of building the laboratory in the nursery, working late into the night with numerous trips to the DIY, sourcing the equipment and literally travelling the world for the know-how, we have finally started production of micro propagated Alstroemeria. The next few years will see improved media formulae analysis alongside growing techniques before production is where I would like it to be. This is the nature of the work. 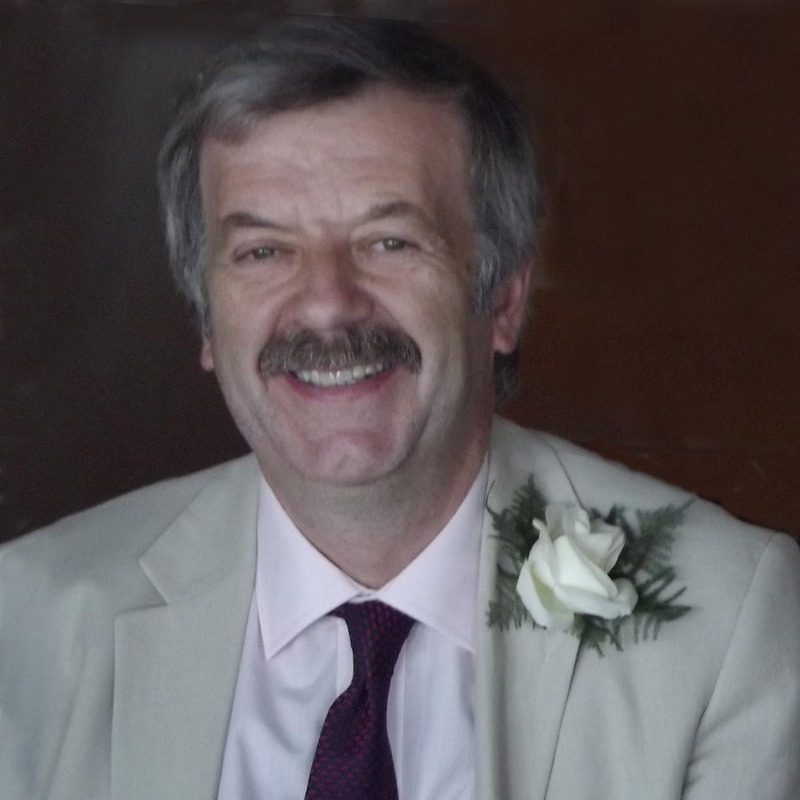 I would like to thank my mentors and tutors: Professor Mark Bridgen at Cornell University, New York and Ros Smith at the Duchy College in Camborne, through Plant Heritage, for their knowledge, kindness and patience in supporting me to achieve this goal. 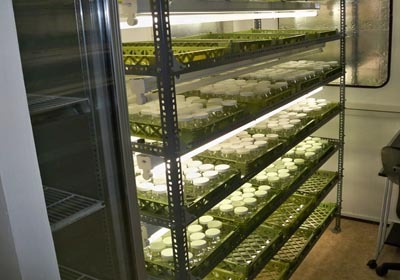 Do please bear in mind that it costs substantially more to grow a plant from micropropagation in a laboratory. Accordingly, I have to charge more for the final article to cover my costs. I wish I could say that this could make me a millionaire, however, this is not the case as there is a simple rule that no-one gets rich growing plants! On 14th February, 2011 we were granted the National Collection status of garden hardy Alstroemeria by Plant Heritage NCCPG National Collections In the collection there are well over 100 garden varieties, along with an ever increasing selection of wild species from Chile. Do come and have a look at them if you are passing but please telephone me first to make an appointment – alternatively you can see them at the nursery open weekends. 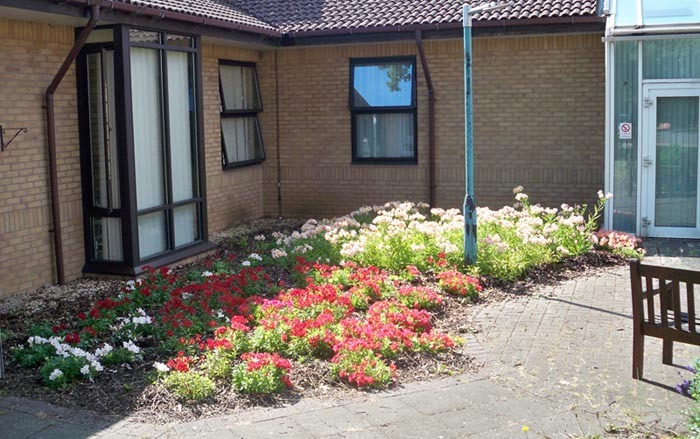 We were delighted to supply a mirror of our National Collection of Alstroemeria to Pershore College in Worcestershire. 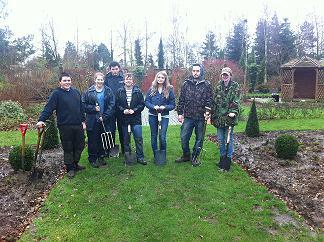 The students have already dug out and created the flower beds which can be easily seen as you enter the college grounds on the left. We have tried to give you a comprehensive guide about our nursery and the plants we grow. If you have any suggestions about what else you would like to see on our site, please let us know by contacting us at the address below.